A Reagan Alzheimer’s Movie? | Dr. Justin Imel, Sr.
An update to this article is posted here. 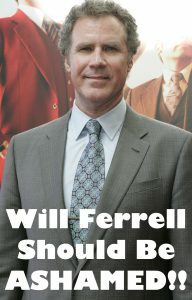 Will Ferrell should be ashamed of himself. According to news reports, the former Saturday Night Live actor will play former President Ronald Reagan in a new film. There’s no trouble in playing a President of the United States on the big screen; in fact, I find great enjoyment in historical films about Presidents. The problem with this film is that Ferrell will play Mr. Reagan in a comedy about the President’s struggle with Alzheimer’s Disease – that’s right, this big shot actor is going to make fun of a man’s struggle with dementia. Patti Davis, the former President’s daughter, wrote a poignant open letter to Will Ferrell. Davis’ letter was the first I’d heard of this “project,” and, I must admit, I was more than just a little aghast. What’s next? Will we make fun of FDR’s struggle to walk after his polio? Will we make fun of JFK’s Addison’s? Will we make fun of the Lincoln assassination or Carter’s struggle with cancer or George H. W. Bush’s use of a wheelchair? But, the issue doesn’t stop at our nation’s Presidents – by making fun of one man’s struggle with dementia, Will Ferrell makes fun of all those who struggle with this horrible scourge. In my ministry, I’ve served many who faced the unknowns of Alzheimer’s. I used to visit one sweet lady, and I never knew who I’d be when I showed up – some days I was her grandson and other days I was her gardener and other days she had no clue who I was. This same lady lost her daughter, and, when someone would mention Vesta’s death, the pain was fresh all over again (I never understood why the staff told her that Vesta was dead when Stella asked if she were coming to visit that day). I’ve visited people with blank stares. I’ve visited people who sang non-stop. I’ve visited people who had trouble keeping their clothes on. I’ve visited people who cursed like sailors when they would never have used such language. I’ve visited people who stole from others around them when they would never have done so. No, I find nothing funny at all about dementia, and I’m appalled that any actor – comedian or otherwise – could find any humor in the plight of Alzheimer’s patients. My own family has recently learned that we, too, face the long goodbye Alzheimer’s brings. Not only am I am observer as I was in my ministry, but I’m now a participant in this agonizing plague. There’s nothing funny about the tears. There’s nothing funny about the lost memories you can no longer share. There’s nothing funny about discussing options as the disease progresses. There’s nothing funny about the fear in your loved one’s eyes when he isn’t sure exactly where he is. There’s nothing funny about Alzheimer’s – nothing – and Will Ferrell’s attempt to find humor in this affliction sickens me to my core. This entry was posted in Alzheimer's, outrage, Ronald Reagan, Will Ferrell and tagged Alzheimeer's, Will Ferrell. Bookmark the permalink.